This paper seeks to present the findings of a study based on learning networks conducted in nine provinces of South Africa during 2013. The aim of the study was to establish to what extent this tool is known or used in the provinces of South Africa. The information was important in order to assist decision makers in future planning to strengthen extension and advisory services. Both qualitative and quantitative paradigm were used to investigate the perceptions of the extensionists with regards to networks, the size of such networks in South Africa, and whether they are known or used by the extension advisors. The quota system was used to extract 10% from the total population of 3 368 which resulted in a sample of 315 extensionists. Data were collected through 315 questionnaires which were later captured and processed through SPSS, version 21. The results showed that: 34% of the respondents were above 20 years of work experience, 56 % were males who dominated the services, and 48 % of respondents were advisors as opposed to other professionals. Northern Cape was the only province which had the majority of advisors that show awareness and used Learning Networks. The study concludes by indicating positive aspects of personal learning networks such as a need for proper guidance and to increase the use of it due to its inherent potential in order to improve service delivery in future. Keywords: Learning networks, Service delivery, Agricultural extension. A study was conducted in nine provinces of South Africa during 2013, which looked into three aspects of agricultural extension service delivery. These were the importance of learning networks, partnerships and extension approaches used by the Provincial Departments of Agriculture. This paper specifically singles out learning networks as one of the tools used with an aim that the information gathered can be used to assist in future planning by the decision makers in strengthening extension and advisory services. South Africa was managed differently prior to the new dispensation of 1994. It had two systems of government namely Central and province, however after 1994 it established three tiers of government namely National, Provincial and Municipality. According to Schedule 6 of the constitution (Constitution of Republic of South Africa, 1986), the provinces have responsibility over the management of service delivery of government departments including Department of Agriculture. The writers have noted that different Provincial Departments of Agriculture (PDA's) are differently named by provincial premiers and at times have to incorporate related or unrelated functions and have long names. The National Department of Agriculture is responsible for ensuring that the management of Extension in South Africa is coordinated and properly managed. There are structures in place to ensure that this function is implemented accordingly. The importance of this move has always been seen in other countries, many African governments, in the early days of independence invested heavily in extension services because extension has always been considered a policy instrument to reach a country national objective such as food security (Van Den Ban & Hawkins, 1990:41). It is also believed that extension has contributed tremendously to post-independence as well as the Green Revolution era. The breakthrough in wheat and rice production in Asia in the mid-1960s, which came to be known as the Green Revolution, symbolised the process of using agricultural science to develop modern techniques for the developing countries of which Southern Africa forms part (Barlough, 2000:1). It is argued that information which led to the Green Revolution could be shared to assist developing countries in different formats, learning networks can be used as a strategy for sharing knowledge and information for development. Poverty has been at the centre for development. It is estimated that Sub-Saharan Africa experience extreme poverty as a result of a number of factors such as: poor soils, uncertain rainfall, increasing population pressures, changing ownership patterns for land and cattle, political and social turmoil, shortages of trained agriculturalists, and weaknesses in research and technology delivery systems (Handley, et al, :6). The problem investigated in this paper is two-fold. The first part is about investigating the alternative approach that will support knowledge to promote agricultural advisory services. The learning networks are seen to have the potential to assist the extensionist in equipping them with knowledge. The critical question is: to what extent are extensionists aware of the learning network? The second part of the problem is linked to the perceptions of the extensionists. The question asked is: are learning networks perceived to be important by extensionists? Both problems have played a role in the development of agricultural advisory services. We should also realize that to a considerable extend, the present food crisis is the result of the long-time neglect of agriculture by political leaders. Even though agriculture provides the livelihood to 70-85% of the people in most countries, agricultural and rural development has been given low priority. The Maputo declaration which was launched in 2003 in which African heads of state and government pledged to allocate at least 10% of their national budgets to the agricultural sector should be seen as an attempt in the right direction for the South African Development Communities (NEPAD, 2003: 2). 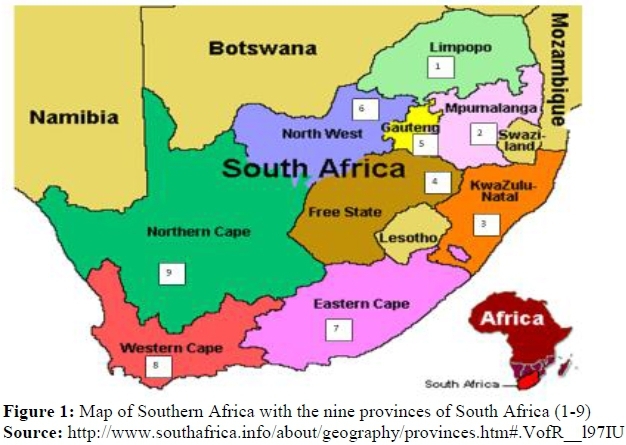 To investigate whether learning networks are known in the nine provinces of South Africa, as well as the participation of the extensionists in it. To test the perceptions of extensionists on the importance of learning networks. One of the weapons to fight poverty in less developed countries is to use extension as a policy instrument (Anderson, 2008). The role played by extension in ensuring food security and sufficiency has been recorded by a number of scholars (Department of Agriculture, Forestry and Fisheries, 2012; Kessabe, 1989:206; Zwane, 2014:6). The development of a country's food basket should not be the responsibility of one sub-system., for example; farmers, research and markets or value chain, but rather all the subsystems including the different networks systems that aim at disseminating information about agricultural development. It is expected that for development to take place, that organisations should be involved (Oakley & Garforth, 1985:13). It is the writer's observations that these networks in South Africa do not receive any prominence in terms of organising extension advisors to facilitate the process of formally contributing towards strengthening extension. The implementation of Extension programmes is a provincial mandate, with the national department playing a coordinating and monitoring role. In South Africa, extension is coupled with advisory and is defined as the active collaborative engagement of all stakeholders, actors and role-players involved in the agricultural, forestry and fishery value chains to support wise decision-making. It should be socially, economically and environmentally sustainable use of resources in the pursuit and advancement of their livelihoods, and this should be within the context of ensuring that each consciously contributes meaningfully to the economy and the welfare of society (Department of Agriculture, Forestry and Fisheries, 2012). The policy for extension and advisory services recommends that extension be elevated to a chief director level in provinces, which is currently at a director level. The extension chief directorate would be responsible for extension and advisory services in order to focus and co-ordinate these state services in an effective, harmonised and appropriate professional, financial and administrative support to personnel and the overall extension and advisory functions (Department of Agriculture, Forestry and Fisheries, 2012). Extension was seen to be at crossroads in the 1980's and some scholars came with different options to revitalise extension in different countries (Rivera, 1989:93). Subsequently, studies were conducted which included privatisation, outsourcing and use of voucher systems (Umali, 1996: 4, Kraft, 1997:3, Still others suggested the use of partnerships learning networks as a way to strengthen extension. This paper is interested in pursuing learning networks. Various studies have recognised the need to establish networks for information sharing (Maatman, Wongtschowski, Heemskerk, Sellamna, Davis, Nahdy, Ochola & Kisauzi, 2011:3). There are different views about learning. An important part of learning is to build one's own personal learning network which consists of a group of people who can guide one's learning, point one to learning opportunities, answer one's questions, and give one the benefit of knowledge and experience. On the other hand, Tobin (1998:2) makes a slight distinction between a network and a Personal Learning Network (PLN). A PLN is described as a group of people or organisations which you connect with in order to learn from them, their ideas and references. The PLN is not limited to online interactions only, it is personal because the tools commonly used are Twitter, Facebook and YouTube. It is always easily accessible. Learning networks have indirect bearing to innovation systems in which some authors have contributed to the debate about information and knowledge systems which in the final analysis boils down to learning networks (Daane, 2010:10). In Kenya for example it has been reported that information brokerages have been identified and studied, and their contribution has been documented (Kilelu, Klerkx, Leeuwis & Hall, 2011:1), and were reported as either formal or non-formal (Daane, 2010:10). The most recommended ones are those that are not formal because participants are able to meet without many red tapes across a wide spectrum of services (Kilelu et al., 2011:1). The network can either assume real or virtual status (Daane, 2010:10), while others saw it as part of Information Communication Technology (ICT) or other systems of technology generation and disseminations like Transfer of Technology (TOT) streams (Engel, 19891:125; Röling,1988:28, and Kaimowitsz, 1990:102). This practice of learning networks is prevalent in various research organisations and it may be given a name like a study group that seeks to study and share about a particular topic of interest by a group of professionals. An important part of learning is to build one's own personal learning network. Which may consist of a group of people who can guide your learning, point you to learning opportunities, answer your questions, and give you the benefit of their own knowledge and experience. This should be seen as innovative way of staying abreast with development. There are four-stage learning model to describe how we learn. These are; data gathering, acting on the information, using the knowledge and creating wisdom. Each stage should be understood with a clear aim that once it is implemented will advance learning. In summary, networking allows extension advisors to connect with other colleagues who possess similar knowledge and by collaborating with them, help to advance learning (Tobin, 1998: 2), and by so doing may help the extension clients. In essence, extension advisors influence the innovation and decision-making process in a direction deemed desirable by farmers' economic and social status. The study targeted all advisors in the nine provinces of South Africa. They were based on a quota from a population of approximately 3 369 extension practitioners in South Africa. They were from the different occupational positions which included agricultural advisors, agricultural technicians, agricultural development technicians, senior advisors, and subject matter specialist at the time of survey. The scope of the study was limited to extension personnel within the Provincial Department of Agriculture (PDAs) primarily to get a deeper understanding of the challenges faced and opportunities that exists in the delivery of agricultural extension and advisory services. A questionnaire was used as the main instrument for survey. Taking into consideration time and the possible cost implications of the study, various methods were used to collect data from selected extension personnel. At first, an e-mail was sent to provincial extension and advisory services coordinators to distribute the questionnaires to district managers who in turn facilitated data collection at district level, both qualitative and quantitative paradigm were used. The completed questionnaires were coded and the data was first captured in Microsoft Excel before being transferred into a statistical analysis programme, the IBM Statistical Programme for Social Sciences (SPSS) version 21 for analysis. Summary statistical data was extracted and then tabulated back into Microsoft Excel for further analysis. The functional sample details are indicated in Table 1. Table 1 shows that out of the 338 questionnaires returned, 315 (93%) were used for the analysis. Twenty-three (7%) of the total returned questionnaires were rejected. Mpumalanga (19%) and Gauteng (16%) provinces had the highest number of rejected questionnaires. The reason for the rejection was incomplete questionnaires. A significant number of questionnaires from KwaZulu-Natal (13%) were rejected for similar reasons. It could be stated that the size of the correct questionnaires returned, 315 as shown in Table 1 was sufficient for a proper analysis. The age of the target group in this case is of great importance for various reasons. First, it indicates the level of experience among extension personnel. Secondly, the result is a cause for great concern as it implies an aging workforce. With the implementation of Extension Recovery Plan (ERP), it is envisaged that more young people would be recruited. A study commissioned by Department of Agriculture Forestry and Fisheries, to assess and evaluate the implementation of ERP for the 2008/09-2010/11 financial years showed that a total number of 913 extension personnel were recruited during the stated period (Department of Agriculture, Forestry and Fisheries, 2013). Even though the age group of the newly appointed extension officials was not specified, one assumes that most would fall below the age of 35 years. Table 2 shows the number of respondents by province and age group. 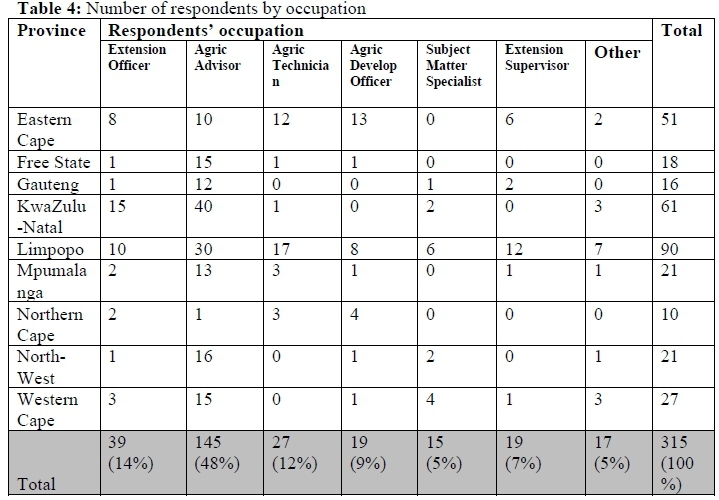 It is quite clear from Table 2 that majority of respondents (108 or 34%) had over 20 years of work experience in agricultural extension and advisory services. Limpopo and KwaZulu-Natal provinces contributed greatly to that with about 49% and 38% of their respondents falling in that category respectively. These results are not unexpected. As stated above, a priori expectation was that most extension advisors would be above the age of 40 and therefore it was expected that most of these officials would have a considerable number of years of service. The trend of the gender has not changed as found by Zwane (2009:38). Agricultural extension profession is known to be traditionally male dominated. Table 3 gives an indication of the number of responses by gender per province. 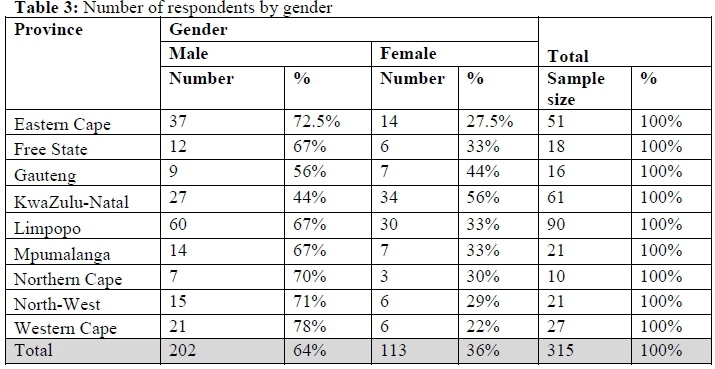 Table 3 shows that 64% of the total respondents were male while females contributed to the remaining 36%. The participation of female respondents was higher, and most importantly above the national average in KwaZulu-Natal (56%) and Gauteng province (44%). Western Cape and North-West provinces had the least number of women participants with 22% and 29% respectively. The remaining provinces had approximately one third of their participants as women. The gender of the extension services is dominated by male as opposed to the female staff, this is in line with the findings of Zwane (2009:38). It should be noted that there is a move towards establishing standard titles for all extension personnel (i.e. agricultural advisors, senior agricultural advisors, and specialist agricultural advisors). However, the ensuing section did not take this into consideration purposefully to establish additional titles that are still being used by extension personnel. The respondents' occupation is indicated in Table 4. 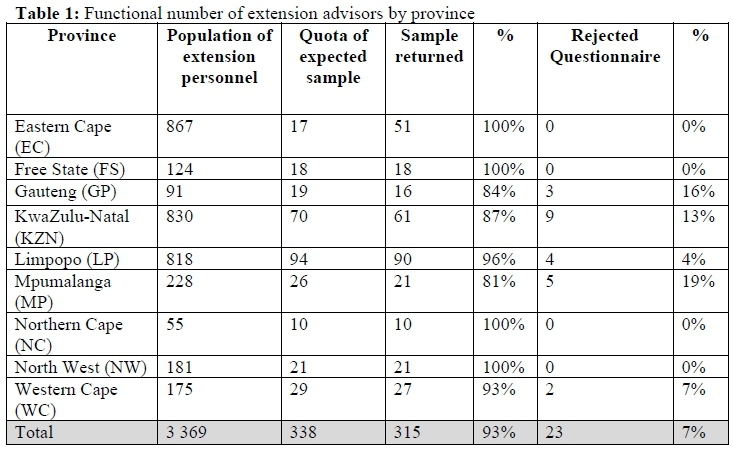 Table 4 shows that almost half of the respondents (48%) were extension advisors while 14% regarded themselves as extension officers. Extension advisors could be seen as one and the same thing, but agricultural technician could mean a professional who has not studied extension science, i.e. the methods of communicating the technical know-how to farmers. In South Africa the naming is being standardised to avoid confusion as advisor, senior advisor and specialist. A specialist in this context is supposed to mean someone without an agricultural extension in his training. As indicated in Table 4, the findings indicated that almost half of the total sample were at the occupation of agricultural advisor while all the other designation were low at varying levels of percentages, yet below 14%. The reason for this trend is that there are many agricultural advisors who are working as advisors not necessarily having the background training in extension methodology. The agricultural extension and advisory service field in South Africa consists of a wide range of professionals ranging from agricultural technicians, subject matter specialist (such as animal health technicians, veterinarians, agricultural economist etc. ), agricultural advisors, and agricultural development technicians among others. Despite extension and advisory services in the country being generally regarded as inefficient and ineffective, most of these extension personnel possess a wealth of experience which can be shared and used productively by their peers. To assess the level of awareness, participants were asked if they knew and participated in any agricultural related learning networks in their provinces. Their knowledge and awareness are summarised in Figure 2. Figure 2 shows that majority of the extension personnel in the Northern Cape (80%), Eastern Cape (67%), and Western Cape (63%) were aware of learning networks in their province. The three provinces also had the highest number of respondents stating that they participated in learning networks, namely 70%, 61% and 52% respectively. As in the case of extension forum, KwaZulu-Natal at 16% had the least number of respondents indicating that they participated in learning networks. These results, may portray a bleak picture and be subjected to misinterpretation. To echo the sentiments of Wenger, McDermott & Snyder (2002:6), learning networks or communities of practice are not a new phenomenon. Agricultural extension advisors learn in one way or another from their peers, farmers, etc. on a daily basis. What is missing is a coordinated and systematic manner in which this learning process takes place. Respondents in this study were asked an open-ended question to state the value, if any, that extension learning networks add in the delivery of extension and advisory services. The respondents' response on the value that extension learning network adds in the delivery of extension and advisory services was more related to that of extension forum. It could not be clearly indicated what the value of networking is. As far as the results are concerned, most respondents felt that extension learning network could be used as a vehicle for sharing information and best practices in agricultural production systems amongst farmers and extension advisors. This is confirmed by the comment of one respondent: "This adds value in sharing information on best practices between extension officials in different areas and different production patterns applicable to their respective regions". Respondents were asked to indicate whether learning networks have some benefits to the advisors. The responses indicated that a personal learning network allows educators to connect, collaborate, and share ideas with other educators, professors, and administrators in the education field. These networks will assist in integrating information from various role players such as researchers, extension advisor, and farmers among others (Tobin, 1998:2). Once extension advisors are equipped through learning networks it can be translated to assist farmers in overcoming their production problems especially when they act on relevant information so that they ultimately attain a high level of satisfaction and sustainable productivity. As far as the demography of the study is concerned, in terms of age, the majority of extensionists have more than twenty years of experience. The gender of the extensionists were male. As far as the occupation is concerned, the majority were the agricultural advisors. The study was premised on two main objectives. The first objective was based on whether learning networks were known and used by extensionists in the nine provinces. The findings suggested that the nine provinces had somewhat different responses ranging from being aware of the learning networks to participating in it. Looking at the importance of a learning network which serves as a way to connect, gather additional insight. The writers wondered how this opportunity got lost in the provinces that they performed below fifty percent, for example four provinces were aware of the learning networks while their participation was somewhat lagging behind. The provinces were Western Cape, Northern Cape Limpopo and Eastern Cape. The other five provinces performed poorly in terms of being aware as well as their participation, they are North West, Gauteng, Mpumalanga and Free State. It can be said that the knowledge of extensionists on learning networks in the provinces is not satisfactory. However, two provinces have shown some extremes, one being the best and the other one being the worst. The province which showed the highest in both participation and being aware of learning networks was Northern Cape with 80% and the least province was KwaZulu Natal with 16%. The second objective of the study was to test the perceptions of extensionists on the importance of learning networks. The study has noted that extensionists perceived the importance of learning networks, for example they saw that it can do two important functions, namely to help expand one's knowledge and perfect one's skills, and that knowledge is one of the resources which is traded by extensionist. It can be concluded that the more advisors exposed to knowledge sets and experience, the more service delivery can be improved among the extension clients. Recruitment of younger extensionists (because the majority of the workforce was aging). There is a need for a smooth exit of the work force without disturbing the service delivery. It is important that more female staff be hired in order to balance the equation which is dominated by male staff members. Extensionists need to be guided on which programmes that will yield maximum results in terms of learning networks. It is not surprisingly to note that extensionists were aware of the learning networks but were not participating. The reason for this tendency was not explained, therefore it is recommended that extensionists need to be encouraged to participate going forward. Proper guidance will need to be given to extensionists about how to use learning networks in order to deliver the best extension because they might not be familiar with the potential of such tools. Learning networks has potential in improving agricultural advisory services and it needs to be implemented through sharing of information and increased professional interaction of the extensionists.